As fall approaches, root vegetables are a key ingredient in the kitchen and beets happen to be one of my favourite. 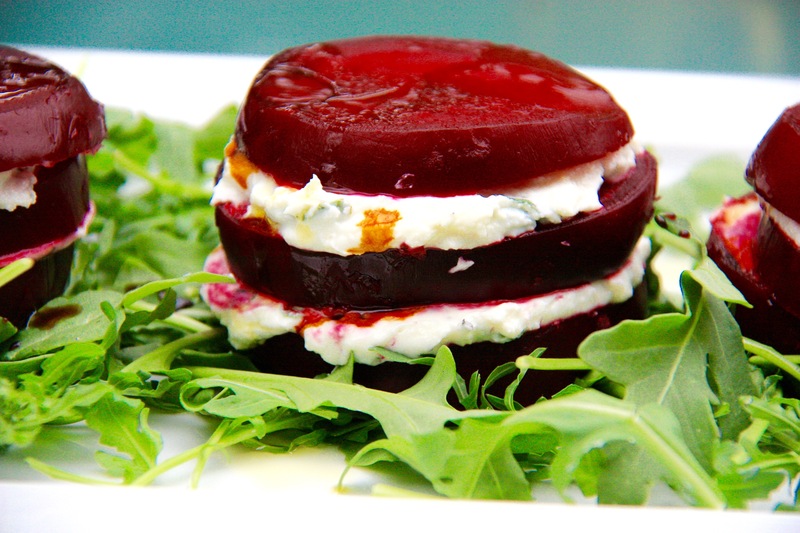 Beets and goat cheese are an irresistible match for a salad so it was a natural pairing for this creation. The zesty lemon and garlic give this dish an additional kick. This salad is perfect for a fancy date night or lunch with friends. Remove goat cheese from refrigerator so it is easier to work with. On each beet, drizzle olive oil and sprinkle a pinch of salt and a few grinds pepper. Wrap the beets individually with tin foil and place in oven on a cooking sheet. Roast until the beet is cooked through, an hour or more. You should be able to pierce the beet with a knife seamlessly. Meanwhile, in a bowl, combine the goat cheese, basil, garlic, lemon juice, 1/2 teaspoon salt, and few grinds fresh pepper. When the beets are cooked through, remove tin foil. Using an old dish rag peel the beets. Cool slightly. Slice the beets into 1-inch thick discs, yielding 3 or 4. Spread a heaping tablespoon of the spread onto each beet leaving one plain. Stack the beets and place the plain beet on top. Carefully transfer to a platter covered with arugula. Drizzle with olive oil and balsamic. Serve and enjoy! Cooking time will vary depending on the size of the beet. I used larger ones in this recipe so it took closer to an hour and a half.